Italian Prime Minister Silvio Berlusconi has told US businessmen they should invest in Italy because it has "beautiful secretaries" and "fewer communists" than before. 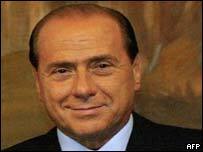 Mr Berlusconi's latest controversial remarks came at a business function at the New York Stock Exchange. "Italy is now a great country to invest in... today we have fewer communists and those who are still there deny having been one," he was quoted as saying. "Another reason to invest in Italy is that we have beautiful secretaries... superb girls," he added. The outspoken Italian leader has caused offence with a succession of previous gaffes. Earlier this month Mr Berlusconi angered Italy's Jewish community by saying that former fascist dictator Benito Mussolini had been a benevolent leader who had never hurt anyone. "Mussolini never killed anyone. Mussolini used to send people on vacation in internal exile," Mr Berlusconi was quoted as saying by Voce di Rimini newspaper at the time. He later defended his comments, saying he had never meant to re-evaluate Mussolini. Only a week before his Mussolini remarks he had outraged the Italian judiciary by describing the country's judges as mad. "To do [their] job you need to be mentally disturbed, you need psychic disturbances," he said. "If they do that job it is because they are anthropologically different from the rest of the human race." And earlier this year Mr Berlusconi, currently acting president of the European Union, triggered a diplomatic storm after comparing a German lawmaker in the European parliament to a Nazi concentration camp guard.